We specialize in the capture and removal of wildlife - we are not actually exterminators, because we do not kill the animals that we deal with. We are in fact very humane to all the wild critters that we deal with. We catch them in live cage traps, remove them as soon as possible (yes, we work on Saturdays and Sundays) and we relocate them. Extermination companies are not equipped or trained to deal with wild animal problems. Their usual approach is to spray some poison around and then get to the next house. They want to establish monthly or quarterly contracts, in which you pay and pay. Not us. 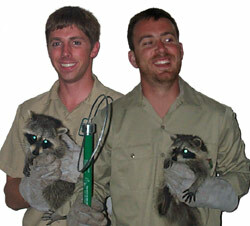 We take the time to do the job right, and we solve your animal or rodent problem permanently. We trap and remove the animals, and solve the root of the problem, by sealing shut any and all entry points into your home or building that allow rodents and critters access. YES, we do rodent control! We consider ourselves the best in rat and mouse control in the Philadelphia area. Yes, Philly, like all cities, has rats, and also mice, and our poison-free approach is the best way to take care of the problem. We will have your house or building rodent free, PERMANENTLY, in little more than a week, and we are safe for your pets or family.